We are excited to offer same day shipping for most of our in-stock items. Orders must be placed by 3PM EST Monday through Friday to qualify for same day shipping. Items with longer lead times will be noted on the product page. We ship to most US states, US territories & Canada. For deliveries outside of these regions, a freight forwarder and payment by wire transfer is required. We do not ship to post office boxes, APO’s or FPO’S. Please contact customer service to discuss any special delivery needs before placing your order. The majority of our orders (both US and Canadian destinations) ship via standard Ground via Small Parcel Carrier (such as FedEx). US destinations - We offer expedited shipping, such as 3 Day, 2 Day and Next Day for most of our products, with some exceptions. Parcel shipments to US territories will ship Fedex International Economy or International Priority. Please contact us for more information. Canadian destinations - We offer 1 to 2 Day and 3 to 4 Day shipping for most of our products, with some exceptions. Please contact us for more information. Some items must ship via freight truck due to size, weight or fragile nature. Items that require truck shipping are noted on the product page. Specific details regarding Freight deliveries can be found on our Shipping FAQ Page. Premium delivery includes inside delivery (limited to 45 minutes) and is available on a limited basis. Your shopping cart will display the premium delivery option if it is available. Check and inspect the package (before the delivery driver leaves, when possible). Before signing the delivery receipt, inspect for the correct number of packages and for damages to packaging and note the nature and extent of any shortage or damage on the paperwork you sign. For freight shipments, this would be a POD (Proof of Delivery). You may refuse delivery only when there is obvious damage to actual merchandise. You must immediately notify us that the order was refused by calling Special Services at 1-855-868-7002. DO NOT RETURN DAMAGED MERCHANDISE. - Please inspect all package contents for damages upon arrival. If damage is found, report damage to our Call Center at 800-572-2194 within 5 business days. Save the damaged shipping box(es) and internal packaging. For freight deliveries, save the pallet(s). For Freight deliveries, you must make a notation on your POD or delivery paperwork describing the exterior damage you see (or you can note “DAMAGE SUSPECTED, FURTHER INSPECTION REQUIRED”). If additional inside damage is discovered, damage claims will only be accepted if the paperwork is noted, otherwise the carrier may deny the claim. Weight: As specified by most Small Parcel Carriers, shipping charges for Ground or Expedited orders are based on either the actual physical weight of the boxes or the dimensional weight (volume) of the boxes, whichever is greater. The difference between actual and dimensional weight can vary greatly. Quantity of Boxes: We package all orders in the least amount of boxes necessary with the required amount of packaging to get them delivered safely. We ship and charge based on the least expensive carriers and methods that we use. Freight / Truck shipments are calculated according to standard NMFC guidelines and specific freight classes and prices quoted include SidewalkSigns2Go's discounts. IMPORTANT NOTE: If you choose to ship on your own account for either ground or freight orders, your shipping costs will likely be much higher than the costs charged by SidewalkSigns2Go. We will not be held responsible for any price differences if you choose to ship your order on your own carrier account. Shipping days and lead times include weekdays only. They do not include weekends, holidays or other published exceptions, which will be listed in the shopping cart during checkout if applicable. Transit times start the business day after the order ships. For example, an order confirmed to ship on Monday via 2 Day Air will arrive by end of business on Wednesday. Customers can track orders on our website here to see estimated arrival times. Tracking will be available approximately 48 - 72 hours after shipment. Many of our items have a published lead-time before shipping, which is separate from the transit time. 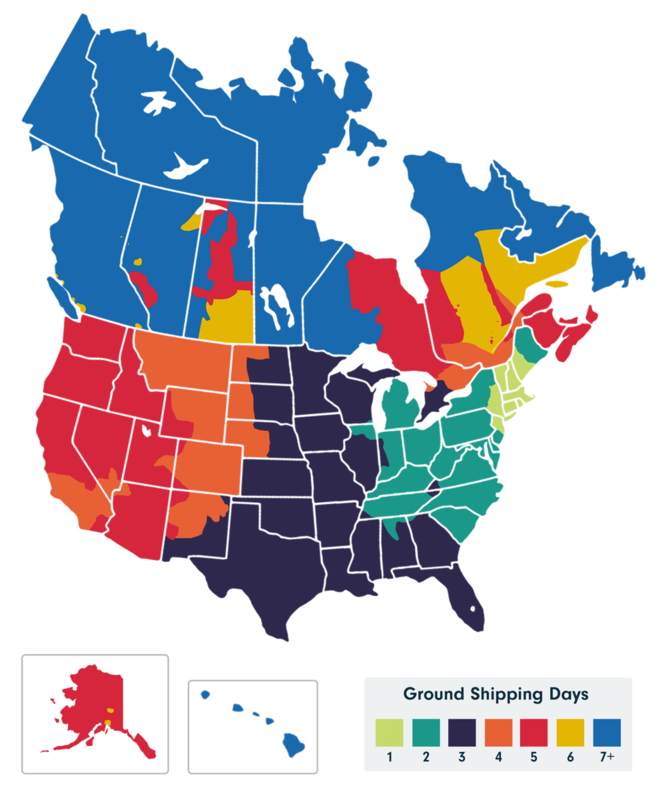 Lead-times for Canadian deliveries are generally longer than US deliveries. Date of delivery is not guaranteed by SidewalkSigns2Go unless “day specific” delivery (expedited shipping) has been chosen. Standard ground estimated transit times are based on the carrier’s published transit times and are subject to change by the carrier. Refunds will not be given for delays on Ground shipments. Refunds will not be given for late deliveries due to Acts of God (weather-related, etc) on Guaranteed, 3 Day, 2 Day or Next Day shipments.